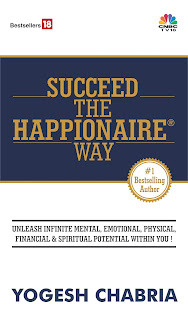 Yogesh Chabria - The Happionaire ​Blog - Best Motivational Speakers In India - Inspiration, Success: Invest The Happionaire™ Way Is Here! 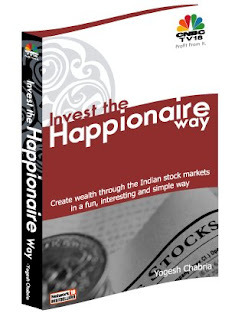 All fellow Happionaires who have been eagerly waiting for our first book Invest The Happionaire Way- need to wait no longer. ITHW is available at major bookstores such as Crossword and soon it shall be available in smaller bookstores across India. Happionaires outside India would need to wait a bit longer to buy it online. Keep smiling and happy reading! Congratulations to you Yogesh and all other Happionaires! I will be rushing to the nearest Crossword after work and will buy myself a copy. I love being a Happionaire and everything about it. It always makes me smile and helps me feel so much nicer. Congratulations from my side also to each and every person who believes in the principles of love, smiling and knowledge. Also the last two reports you shared really helped my investments a lot. I would be grabbing my copy this weekend. Another big big congratulations to you Yogesh for removing such a wonderful book which is a sure shot bestseller!!!! Just got a copy Vivek from Crossword in Bombay. The Kemps Corner one has it displayed very prominently. I haven't read it yet, but it feels lovely and thankfully is in hard cover. I think it should be available at Landmark too- maybe a bit later. I don't think it will be available exclusively at Crossword because it is surely a bestseller! I purchased my copy from Shopper's Stop in Juhu and I must say the book is very nice and as usual I loved the humbleness in your introduction itself and the fact that you remembered all of us. Congratulations Yogesh and I hope to read many more of your wonderful thoughts and ideas. This is great for all of us because it is proof that smiling and goodness are what win. I bought a copy of Invest The Happionaire Way today itself and have started reading it. It feels as if you are right here with me and speaking to me. Very nice and simple language but at the same time I am learning not just about stocks but many more things. I would suggest it as a must read for everybody too. Is there a Crossword in Blore? BTW Yogesh, why this exclusivity with Crossword? Thank you so much for the warmth and love. I believe that when we give love and respect, we get the same in return. It was very touching to read the several e-mails I have started getting from people who have read the book. It is good to know that it is making people smile. You can also request Landmark to order the book for you. The publishers are Network18 publications. Really sorry for the trouble Vivek. I just got five copies of Invest The Happionaire Way. I will be keeping one and gifting the others. Congratulations! Congratulations Yogesh. Will be buying to book this weekend. Great work sir. I will get a copy and I hope to see next book on more advanced fundamentals. Our city doesn't have a crossword so am stil waiting for it to be avliable online. Hope it doesn't take too long!! Many many congratulations and thanks for publishing this happionaire book. I am currently not in India, but have told my brother to get one copy of this book for me. He will handover the copy through one of my colleague in India who will be coming from India in another 2 weeks. Hope to get the copy soon. I wish you all the best and am sure it has to be the bestseller book. Congratulations Yogesh!!!!!!! I'm really looking forward to buying a copy but sadly I'm in Tokyo. I wish I had somebody coming from India with the book like you Sandesh. I'm sure it will be a big hit and a bestseller and a book that is a must read for every investor for several years to come. Lots of love and smiles for all happionaires! Another huge and big congratulations to you Yogesh!! But as a few other fellow Happionaires I would have to wait for it till I can buy it online as I'm based in London. I agree with Sandesh, Naina and all the others, it is a book that will surely be a bestseller because you write so simply and from the heart. I'm sure it will motivate and inspire millions of people. Keep up the good work and making people smile! Great book. Just started reading it and am loving every word of it. I like the packaging also. Very nice. Congrats. The main USP of Invest The Happionaire Way is the simple and friendly language. It helps people like me understand and also have fun while reading. It was also very motivating and inspiring. I'm sure everybody else will like it too. I am looking forward to another book which explains things more in depth for people who have read the first book. I agree with you, what got me reading (and I am still reading) is the simple and personal language. It feels like a friend is speaking to me. It is a great read for anybody who wants to learn more not just about investing but also needs to be motivated. Ive already told a few friends of mine about the book and everyone is eager to get our hands on it. Do try and improve the distribution outlets - having it sold only through CROSSWORD dosent help anyone. I had the same problem Vivek but just checked Yogesh's latest post and it seems we can order it via e-mail. Nice to know he listens to us. All us girls are very eager to buy the book too and after reading what others have said I'm sure it will be a great book! I have always loved the way Yogesh writes anyway. Pretty simple and direct. It is a must read for anybody who is investing. I don't think anybody should make the mistake of investing without reading this book. Everything is shared in the form of a nice story about Yogesh and how he started investing when he was very young. I have become a big fan of the Happionaire way!!!!!! It reads very well and is very simple to understand. I loved it. Keep it up! Excellent book sir. I would suggest it to anybody who wants to make money out of investing. Also very motivating book. Congratulations Yogesh. Will be getting a copy soon when I get time and visit Crossword. Yes Somaya, i also cant wait to get my hands on this book. Have you ordered it online - if so, can you let me know how long it takes for delivery? unless they deliver it in 2-3 days. Finally caught your book Mr. Handsome. ;-) I have been very busy but I must say the book was a great read as expected. Oh just one more thing, now I think I know who my lovely g. really is. I shall need to search for new assets now! The best assets are usually the scarcest. I'm based in Dubai and I think I'll need to buy the book when I come down to India within the next month. I can understand your side too Yogesh since it is your first book that is why distribution is a bit challenging. But now that you know so many of us really want to get a copy, please make sure your next books have a world release. I think what is special about you, is that you don't just talk about investing but other things too. That makes you like a friend for millions of us. Good to know that you liked the book :) Do suggest to everyone you know!! I just loved every word of it Yogesh. This is what the youth of our country needs to be charged up and take on the world. Your book is truly meant for a new India which is confident and ready to take on the world. Also it is damn cool to have a website and blog. I was pretty bored with all those artsy Indian writers talking about stuff we don't care about. We finally have somebody who just writes from his heart and speaks our language. Making money and having fun is something we should do with pride! The very first moment when I read your notes/articles I was happy to feel that finally someone who is not ashamed to confess, mainly in today's rapid-processing self centered world, that being a simple, good, happy person with belief in sharing knowledge is what all a person with wealth is all about. And then in life rest follows be it education, careers, stocks or hard cash etc. Welcome yogesh to our world where we lose our present thinking about our future, cribbing about our past. And thankyou again for generating positive spirits among all of us and remininding us not to lose track of living life kind size! Came to hear about your book.At present i am working in saudi arabia and i have requested a copy of the book from my collegue who is on vacation and will return here next week from Trivandrum,Kerala. Will the book be available there.If so,where. would be buying this book soon! !liked the way you describe the situation.